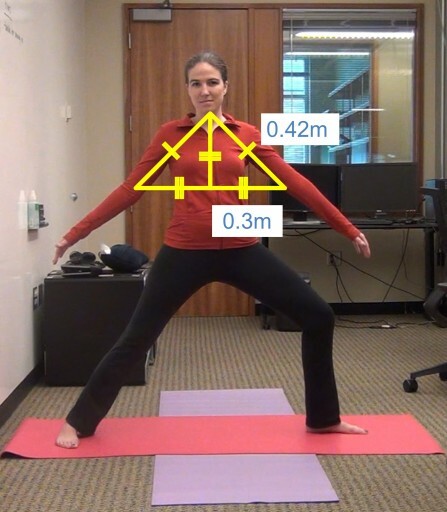 University of Washington computer scientists have created a software program that watches a user’s movements and gives spoken feedback on what to change to accurately complete a yoga pose. The program, called Eyes-Free Yoga, uses Microsoft Kinect software to track body movements and offer auditory feedback in real time for six yoga poses, including Warrior I and II, Tree and Chair poses. Project lead Kyle Rector, a UW doctoral student in computer science and engineering. and her collaborators published their methodology (open access) in the conference proceedings of the Association for Computing Machinery’s SIGACCESS International Conference on Computers and Accessibility, Oct. 21–23. The result is an accessible yoga “exergame” — a video game used for exercise — that allows people without sight to interact verbally with a simulated yoga instructor. The technology uses simple geometry and the law of cosines to calculate angles created during yoga. For example, in some poses a bent leg must be at a 90-degree angle, while the arm spread must form a 160-degree angle. The Kinect reads the angle of the pose using cameras and skeletal-tracking technology, then tells the user how to move to reach the desired angle. Rector and collaborators plan to make this technology available online so users could download the program, plug in their Kinect and start doing yoga. The research was funded by the National Science Foundation, a Kynamatrix Innovation through Collaboration grant, and the Achievement Rewards for College Scientists Foundation. People who are blind or low vision may have a harder time participating in exercise classes due to inaccessibility, travel difficulties, or lack of experience. Exergames can encourage exercise at home and help lower the barrier to trying new activities, but there are often accessibility issues since they rely on visual feedback to help align body positions. To address this, we developed Eyes-Free Yoga, an exergame using the Microsoft Kinect that acts as a yoga instructor, teaches six yoga poses, and has customized auditory-only feedback based on skeletal tracking. We ran a controlled study with 16 people who are blind or low vision to evaluate the feasibility and feedback of Eyes-Free Yoga. We found participants enjoyed the game, and the extra auditory feedback helped their understanding of each pose. The findings of this work have implications for improving auditory-only feedback and on the design of exergames using depth cameras.